Seasonal Camping at Coy and Wilma’s is very simple. 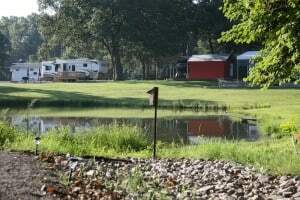 Campers lease their campsite for the calendar year. They leave their campsites set up during the off-season, and then camp as often as they like during the camping season (March 15th through November 15th). Each campsite has water and sewer hookups, and a 30/50 amp electrical service and most are big enough to accommodate a bunch of extras like canopy’s, boats, cars, sheds, decks, gardens, fire pits and even in-laws. The camping season lasts 8 months, but seasonal campers may extend their season by purchasing two-week extension blocks for $50 each, allowing them to camp anytime in the off-season for a consecutive two-week period. Extension blocks are an economical way for campers to get an early start on Crappie season, to hang around for deer and waterfowl hunting seasons, or perhaps spend the holiday camping when the weather is right. Campers are responsible for utilities expenses and maintenance of their campsites and camping equipment. Campsite utilities and rent are assessed on a quarterly basis and paid electronically using our camper portal.